HVAC Ready For The Fall? – AirZona HVAC Inc.
Ready or not fall is coming. Shorts and flip flops will be put away and that winter clothing in the back of the closet will make its way to the front. Winterize the pool, and get ready to face the cold. Well, cold for us here in Phoenix. One job is taking care of your HVAC system. You will need to prepare your furnace for the winter. There are some tasks you will need to take care of, but much of HVAC system maintenance will require expert attention. Here are a few steps to prep your HVAC system for the fall season. We thoroughly examine your furnace to make sure that it is ready to give you the warmth you need when winter arrives. In addition, this house call will improve the overall efficiency of your system, resulting in a lower utility bill and less wear and tear on the unit. Hopefully, you change or clean the filter in your air conditioner and furnace monthly. However, if you’ve been negligent you are not alone! A dirty filter can cause your heating system to have poor air flow and issues overheating causing safety issues. Checking the filter to make sure that it’s not clogged with dirt or debris, you will help to keep your HVAC system operating efficiently and keep the air free of airborne allergens and contaminants. If you have a heat pump, you need to check the outside portion of the unit, for signs of debris or damage. To clean the unit, start by turning off the power. Then take a hose and rinse out all the dirt, leaves, and twigs that have accumulated over the spring and summer. If anything is stuck or difficult to remove or there is any sign of damage, contact your HVAC technician. Ensure you are using and programming your thermostat correctly. The preventive maintenance visit is a perfect time to check with your technician if you are unsure about how to correctly program your thermostat. Keep all vents/registers open so heat will circulate properly throughout your home. Keeping vents closed can damage the ductwork and HVAC system. To help your furnace to do its job, you will also need to check the windows and doors around your home and seal air leaks that could allow drafts to enter your home. Caulk and weatherstripping are simple and inexpensive materials that go a long way toward reducing energy waste. Taking preventive action is important for efficient HVAC performance and to help your system to live up to its expected life. 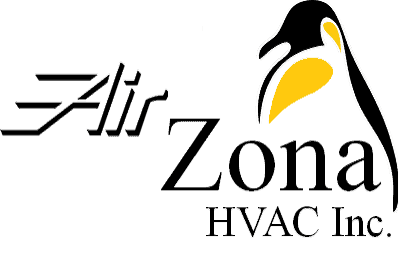 Our technicians at AirZona HVAC can provide services and advice that will guarantee comfort throughout the cold winter months. Give our experts a call at 623-295-1911 to learn more about getting your furnace or other heating system ready for winter, or about our energy-efficient HVAC systems.